“Military units should devote efforts to agricultural production to be partly self-sufficient and reduce the burden of the people”, said Ho Chi Minh. 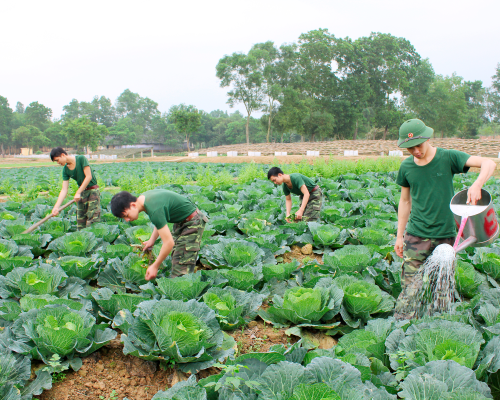 Following Uncle Ho’s teachings, the Army Corps 2 has regularly stepped up agricultural production and practice of thrift and improved the quality of logistics support, meeting the mission requirements for a regular Corps. Being imbued with Uncle Ho’s teachings and fully aware of the importance of the logistics work in general, the improvement of troops’ life and its combat strength in particular, over the past years, the Corps has stepped up this work via practical contents and measures in accord with the particularities and missions of a mobile active corps while considering it as an important element of the implementation of the 12th Politburo’s Directive 05-CT/TW. Based on experience learnt from organization of agricultural production in the past years, the Corps’ Logistic Branch has proactively counseled the Corps’ Party Committee and Command as well as party committees and commands of units to strengthen leadership and direction over agricultural production and practice of thrift, and to promote the core role of logistics staff in directing and instructing the implementation of this work. Grounded on the Logistic Department’s counseling, the Corps has issued directives, regulations and guiding documents on agricultural production; directed units to include this work in their leadership resolutions; taken the results of production and improvement of troops’ life as a criterion for the implementation of the Politburo’s Directive 05-CT/TW and the assessment of a comprehensively strong unit. To follow Uncle Ho’s teachings self-consciously and effectively, the Corps has focused on overcoming troops’ thought on “working for nothing” in agricultural production. To do so, in addition to enhancing the work of propagation and education regarding this task for cadres and troops, the Logistics Department has focused on studying and making annual and long-term plans for agricultural production. At the same time, it has advised the Corps’ Command on directing units to develop plans for agricultural production associated with master plans for barracks site and to carry out production synchronously at all levels on a concentrated, sustainable, closed, basic, long-term, focalized basis. The Corps’ units have been asked to shift from large-scale production to qualitative one and resolutely eliminate small-scale, unscheduled production. Moreover, regulations on managing and using produce have been designed. Following Uncle Ho’s teachings and the Corps’ guidelines, units have actively promoted internal resources and made best use of and improved lands and ponds to develop the 5-basic model (garden, pond, cage, pergola, and food processing station) in accordance with the particularities of each unit and stationed area. Moreover, due attention has been paid to closely combining cultivation and breeding with food processing; to increasing battalion-level production to directly improve troops’ meals. Specifically, priority has been given to building concentrated production zones and gardens to plant high-quality vegetables of all types for long-term reserve; to actively mobilizing resources for units to develop production in a sustainable, environment-friendly, hygienic manner. At the same time, units have been required to build a contingent of cadres and employees in charge of agricultural production, particularly for concentrated production zones. Meanwhile, the role of military supplies organs in giving instructions on and disseminating experience and techniques for cultivation and breeding to troops has been brought into play. Over the past years, in addition to dispatching cadres and professional employees to attend technical training courses held by higher echelons, the Corps has regularly organized field trips to study experience and new techniques of prestigious production units in the area in a bid to ceaselessly improve the staff’s knowledge and skills as well as each unit’s quality of produce. From capitals of higher echelons and the unit, up to now, the Corps has basically completed a system of gardens, ponds, cages, and pergolas including 2 division-level concentrated breeding zones, 10 regiment-level concentrated production zones. The system of alleyways, spouts and drains of the gardens has been hardened. Furthermore, the Logistics Department has directed units to diversify types of livestock and crops; to actively plant catch and overlapping crops and conduct specialized and intensive cultivation; to develop concentrated breeding farms and combine concentrated breeding with scattered breeding in the industrial and semi-industrial direction to firmly maintain food supplies, particularly in pre-harvest periods. It is worth noting that to increase productivity and economic efficiency, the Corps has increased production of breeds and seedlings to reduce the costs and applied modern technologies to production. Besides, in recent times, the Corps has invested in building many new, efficient models of agricultural production. A part from cultivation and breeding, significance has been attached to building and enhancing the efficiency of food processing stations and slaughterhouses to set up a closed process from production and processing to use of produce. Up to now, the Corps has had 5 husking stations and 12 food processing stations, ensuring sufficient supply of rice and meat for offices and units. To deal with the fluctuation in food price and ensure troops’ ration, the Logistics Department has proposed the construction of a system of depots for reserving rice for husking stations and vegetables for regulating produce within the Corps. With the effort made by all cadres and troops, since 2015, the Corps has produced 5,710 tons of vegetables, 3,187 tons of meat, 1,312 tons of fresh fish and tens of millions of poultry eggs. The gross output of production and services (excluding the production cost) is worth above 48.5 billion VND. Thanks to the development of agricultural production, the Corps has been self-supplied 100% of vegetables, pork and poultry eggs, 85% of fresh fish, and 55% of breed pigs. Units’ produce which is used for troops’ meals is cheaper than that in the market, thereby maintaining and considerably improving the quality of troops’ meals, partly stabilizing market price and fostering socio-economic development in the stationed area. Thoroughly understanding Uncle Ho’s teachings: “...economizing aims to facilitate agricultural production which will help gradually improve the standard of living of troops, cadres and people”, over the past years, in addition to fostering agricultural production, the Corps has focused on stepping up the practice of thrift and fighting against corruption and wastefulness. The Logistics Branch has counseled party committees and commanders of units to enhance propagation and education to raise cadres and troops’ awareness towards the practice of thrift, sustainable, effective use of materials, and the fight against wastefulness, and to adopt measures to save budget, materials, and troops’ time and effort. More specifically, the Logistics Department has directed logistics offices at all levels to closely combine supply with strict management and maintenance of the regulations and orders for logistics and financial works. At the same time, it has advised the Corps on reviewing, supplementing and completing the system of regulations on management and use of budget, oil, electricity, water and tools; on intensifying democracy and transparency in entitlements and assigning norms to each task and unit. Grasping the guidelines “thrift must be associated with measures to combat wastefulness and corruption”, the Corps has directed its offices and units to promote the role of party committees and commanders at all levels in inspecting and supervising tasks directly related to the use and management of materials, particularly budget for capital construction. In this regard, focuses have been placed on conforming to principles and regulations on management and use of materials; on strictly executing steps from cost estimation to spending and balance settlement to ensure transparency. As a result, since the beginning of this year, the Corps’ Logistics Branch has saved over 10 billion VND. The Logistics Branch’s achievements in the practice of thrift have contributed to making a positive change in self-awareness and daily lifestyle of cadres and troops. Promoting the gained results and experience to follow Uncle Ho’s teachings and the Central Military Commission’s Resolution 623-NQ/QUTW on the military logistics work until 2020 and beyond, in the coming time, the Corps’ Logistics Branch will continue to focus on advising the Corps’ Party Committee and Command on the logistics work in general, agricultural production in particular, while promoting its core role in direction and implementation. To do so, attention will be paid to maintaining and developing models of agricultural production into models of goods production; to improving the effectiveness of production, processing and slaughter establishments at regiment, brigade and division levels and equivalents. Importance will be attached to close management, clear accounting and pricing of produce from units’ production, determinedly maintaining and improving troops’ life and the Corps’ combat strength, ensuring the Corps’ readiness to undertake and successfully fulfil the task in all situations.